Achieving food security is central to a reduction in starvation and hunger as well as attainment of the Sustainable Development Goals (SDGs). Food security has been conceptualized in different but complementary ways. The World Bank defined it as a condition where everyone has access to sufficient food to live a healthy and productive life. The Africa Bureau of the United States Agency for International Development (USAID) defines it as a situation when everyone has physical, social, and economic access to sufficient food to meet their dietary needs, produce, and stay healthy. According to the Food and Agricultural Organization (FAO), food security exists “when all people, at all times, have physical, social and economic access to sufficient, safe and nutritious food that meets their dietary needs and food preferences for an active and healthy life”. From the above perspectives, food security entails a production of diverse, safe, and nutritious food that can sustain the consumption demand of the population. It also requires that availability of food is backed by consumers’ purchasing ability to acquire desired food varieties that promote their well-being and wellness. Meeting this goal in the face of myriad development challenges confronting Nigeria remains a daunting exercise. This article identifies pressing issues hampering food availability, stability, accessibility, and utilization in Nigeria and proffers short, medium, and long-term solutions to address the problems. Nigeria is facing a lingering food crisis. Between 2008 and 2013, production of staple cereal foods (maize, millet, rice, sorghum, wheat, and other cereals) declined by 11.8% from about 28.8 million tons to about 25.4 million tons. Also, spice (pimento and other spices) and tomato production shrank by 1.7% and 14.1%, respectively over the same period (Fig. 1). An observed decline in food production vis-à-vis a projected 2.7% annual population growth in the country poses a serious food security challenge. A recent joint stakeholders’ report on the food insecurity situation in 16 states in Northern Nigeria indicated that over 3.7 million people are food insecure. Based on the report, a total of 3.5 million people are currently in food crisis while 999,959 are in an emergency situation in need of urgent assistance. This is more pervasive in the northeastern part of the country where a State (Borno) is said to account for over 50% of the burden. 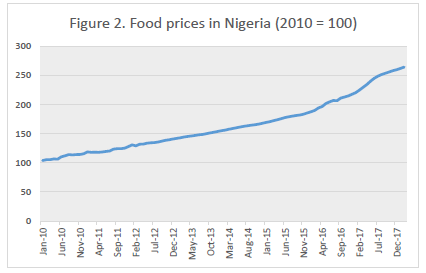 It is noteworthy that the actual food insecurity situation in Nigeria may be some percentage points higher than the one reported above given that the report did not capture the food security situation in the southern part of Nigeria. 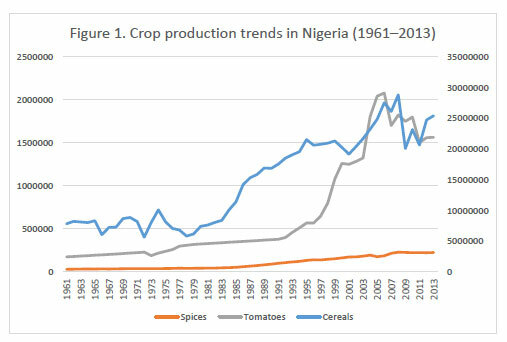 The underdeveloped nature of markets for agricultural produce in Nigeria is another factor posing threats to the food security situation in Nigeria. Food market infrastructure (e.g., good road network, storage facilities, marketing boards) are not readily available or rather underdeveloped in Nigeria. Existing markets in the country are too fragmentary and disintegrated from the farm. Most farmlands have no functional road networks that would make for easy transportation of farm produce from farm to the market. Consequently, most produce decays in transit before getting in the market. Facilities to store and preserve raw agricultural produce before shipping to the market are grossly inadequate. About 30 to 40% of food produced in Nigeria is wasted because of poor preservation capacity . This loss is estimated at about US$8.9 billion annually . Postharvest losses have received great attention among agricultural research institutes and multilateral institutions in recent times. Unattractive agricultural financing mechanisms limits enterprising initiatives along the agricultural value chains. Ensuring safe, available, and affordable food products requires a roadmap that actively promotes agricultural value chain development. This entails the development of initiatives that enhance the spring-up of agro-based industries in the areas of processing, packaging, storage, and marketing of agricultural produce. Current financing arrangements for the agricultural sector in Nigeria are mostly left in the hands of the financial institutions that always view agricultural ventures as unattractive and would rather extend credit to high-risk, high-reward ventures on a short-term basis. A recent report by the National Bureau of Statistics (NBS) indicated that the agricultural sector received only 3% of total bank credit allocation in the third quarter of 2017 . This sectoral credit allocation to agriculture seems not far-fetched given the high lending rates of banks to the sector (which currently averages 18%). The Central Bank of Nigeria (CBN) Anchor Borrowers Programme which took effect in 2016, seeks to lend to smallholders farmers at lower interest rates (as low as 9%). However, the scheme has not been effectively managed given the high number of cases of default by farmers . It is important to note that current agricultural interventions are ostensibly limited to agricultural production (crops, fisheries, and livestock) to the neglect of the value chain—a strong lever of food security. The challenges related to violent conflict necessitate profound approaches. In the short term, the government should scale up existing collaboration with neighboring countries (especially Niger, Chad, and Cameroon) towards countering the Boko Haram menace and other seemingly growing cross-border armed conflicts in West Africa. Also, large-scale orientation and education of herdsmen on the need to respect property rights should be institutionalized. Over the medium term, internal security and intelligence need to be adequately strengthened for early detection of crime and prevention of violent conflict. Also, there is a need to establish grazing reserves for the herdsmen and to strongly discourage cattle encroachment on farmland. In the long term, modern innovative techniques of cattle rearing should be explored and embraced. To enhance the market for agricultural produce, there is a need to invest massively in road distribution networks that connect farms to the market and to the cities. More can be achieved through innovative public‒private partnership on infrastructure financing especially in the rural areas. Also, consideration should be given to the restoration and empowerment of the defunct marketing boards in Nigeria. Having an independent board with a mandate to buy and absorb agricultural produce from farmers during bumper harvests and preserve them to sell during postharvest periods can help minimize losses. More result-oriented approaches can be delivered through appropriate public‒private collaboration that enhance value chain development. Making agriculture profitable remains key towards attracting funds to the sector, fostering innovations that encourage wide-scale mechanization, and enhancing value chains towards food and nutrition security in Nigeria. Kah H.K. 2017. “Boko Haram is Losing, but so is Food Production: Conflict and Food Insecurity in Nigeria and Cameroon”. Africa Development, Volume XLII, No 3 pp. 177-196. USAID. 2015. Nigeria – Complex Emergency, USAID. World Bank. 1986. Poverty and Hunger: Issues and Options in Developing Countries: A World Bank Policy Study, Washington, DC. : World Bank.